Roasting is a great cooking method for a large, tender cut of beef — such as a rib or sirloin roast. Sirloin-tip, rump, rolled-rump, eye-of-round or top-round roasts will also benefit from this cooking method if they are graded prime or choice. Lesser grades and lesser cuts will benefit more from a wet cooking method, known as braising. 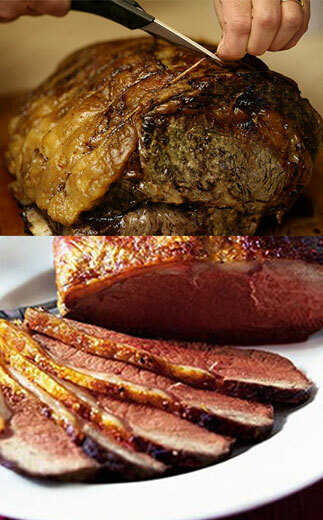 There are two schools of thought on roasting: cook the meat from start to finish at a consistent medium temperature, which reduces shrinking and sputtering and produces a juicy, evenly-cooked roast; or put it in a very hot oven to start, and then lower the temperature for the remainder of the cooking time, which helps brown the roast and its juices (contrary to a widely held belief, however, it does not sear the surface and thereby lock in its juices). In either case, you should let the roast warm up to room temperature for an hour or two. You may want to season it with salt and pepper and/or rub it with a garlic clove. Place it on a wire rack in a fairly shallow roasting pan (so it doesn’t steam in its own juices and so that the heat circulates freely), and pop it in the oven. If there is a layer of fat on the meat, keep that on top. Various cuts of meat take different amounts of time to cook. In an ideal world, everyone would have a thermometer — either an instant-read thermometer or a meat thermometer that stays in the roast the whole time it’s cooking. Then you would know that the roast is done when the temperature in the center of the roast reaches 120°F to 125°F, (49°C to 52°C) for rare, 130°F to 140°F (55°C to 60°C) for medium rare, 145°F to 150°F (63°C to 66°C) for medium, and 155°F to 165°F (68°C to 74°C) for well done (Note: 120° is a pretty rare roast). Without a meat thermometer, you’re taking a bit of a gamble. The size and shape of the meat, the amount of fat and bone, how the meat was aged and other factors affect how long it should cook. In fact, more and more cookbook authors have given up the practice of putting a roasting chart in their books.. Cooking at a constant oven temperature of 300°F (160°C), a 5- to 8-lb standing rib roast will take 17-19 minutes per pound for rare, 20-22 for medium rare, 23-25 minutes for medium, and 27-30 minutes for well done. A sirloin roast of 8- to 12-lbs will take 16-20 minutes for rare, 20-22 for medium rare, 23-25 for medium, and 26-30 for well done. A boneless top round, by contrast, will take 28-30 minutes for rare, 30-33 for medium rare, 34-38 for medium, and 40-45 for well done. If you roast at 325°F (160°C), subtract 2 minutes or so per pound. If the roast is refrigerated just before going into the oven, add 2 or 3 minutes per pound. We won’t even attempt to suggest times for the initial-hot-oven cooking method. After the roast comes out of the oven, let it rest for 15 to 20 minutes, which allows the juices to become more evenly distributed within the meat and makes it easier to carve. The temperature of the roast will rise 5° to 10° after you take it from the oven, so if you are using a thermometer, you should take it out a bit before it reaches the desired temperature.